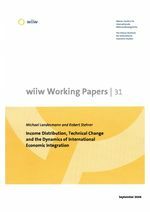 This paper explores the features of a dynamic multisectoral model which focuses on the relationship between income distribution, growth and international specialization. The model is explored both for the steady-state properties and the transitory dynamics of integrated economies. Income inequality affects the patterns of growth and international specialization as the model uses non-linear Engel curves and hence different income groups are characterized by different expenditure patterns. At the same time income distribution is also reflected in the relative wage rates of skilled to unskilled workers, i.e. the skill premium, and hence the wage structure affects comparative costs of industries which have different skill intensities. The model is applied to a situation which analyses qualitatively different economic development strategies of catching-up economies (a 'Latin American' scenario and a 'South East Asian' scenario).